In the opening minutes of the movie Contact, the camera scans back from the Earth, passing planets, stars, and galaxies, until the view illustrates our own insignificance in the vast universe. It is a great metaphorical foundation for the key message of this movie – there is no inherent meaning to our lives. We must create that meaning ourselves. 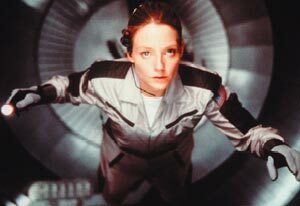 Dr. Eleanor Arroway, as played by Jodie Foster, has a clear focus for her life. She believes there are other living beings in the universe and she wants to make contact with them. She spends years listening to the sounds of the stars, searching for any faint signs of vitality. Her passionate pursuit of her dream attracts like-minded people and funding support. Her clear vision enables her to deal effectively with the inevitable failures, skepticism, and apathy that any dynamic person will meet along the way. Dr. Arroway’s proactive pursuit of her goal enables her to get up every morning with a sense of purpose and personal meaning. What great things our planet would have accomplished if every person had such a commitment to personal interests. How healthy, colorful, and fulfilled we’d all be. A ‘sense of meaning’, the connection of something inside you to something you are doing, would be a reality for us all. We’d each know what Dr. Arroway knows about owning our existence. She tells her colleague, “I’ve always believed that the world is what we make it.” This is a very healthy way to be in a universe that doesn’t know we exist. The world is what we make of it. Of course things beyond our control will impact our lives. However, we control how we handle those things. More importantly, we decide every day how we will use our free time. Too many are just watching the world. You can’t make a meaningful existence while sitting on the sidelines. It is those proactively exploring personal interests and connecting to humanity that feel vitalized by their existence. Interested in more posts about LIFE?